We have heard the story about Jesus. Jesus is the Son of God. He came to the earth as a man and taught the people about God. He did many great works that showed people that He was God. But some men hated Jesus. They did not like what He said. They told lies about Him, and had Him nailed to a cross so that He died. Jesus let them do this. Jesus died on the cross to pay for our sins, but He rose again from the grave. He appeared to His disciples and showed them that He had defeated the power of Satan and sin. Then Jesus said to His disciples, "My Father God has given Me all (great) power. So I want you to go everywhere in the world and tell every one about Me. Tell them how I can forgive their sins and give them eternal life. I will be with all of you, all the time, even until the world ends." Jesus told His disciples that it was time for Him to go back to Heaven to be with His Father God. He took His disciples to a little mountain nearby called the Mount of Olives. Then Jesus said to them, "I want you to wait here in Jerusalem for a little while. I will send the Spirit of God to you. He will live in you and fill you with the power of God. Then you will be able to go and tell everyone, everywhere, about Me. (Start at Jerusalem, then go to Judea, then Samaria, and then to all the world.)" 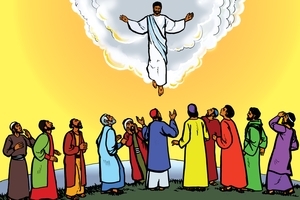 When Jesus had finished speaking, He rose up in the air and went into a cloud, and His disciples could not see Him any more. Suddenly two men dressed in white clothes were standing beside them. They were God's messengers (angels). They said to the disciples, "You saw Jesus go up into heaven. One day later on He will come back again, just like that." The stories in this book tell about the disciples of Jesus and how they went to many places to tell people about Jesus. God's Spirit was with them and gave them power to do many great things. They were able to get many other people to become disciples of Jesus too. What they did can be an example for us too. Jesus still wants us to tell other people about Him. His promise to us is that He is with us always. Jesus returned to heaven and His disciples went back to Jerusalem. They waited there, as Jesus had asked them to. Ten days later an amazing thing happened. Jesus' disciples were all meeting together in a house. Suddenly they heard a loud roaring sound, like a very strong wind, coming from the sky. The sound became louder and filled the whole house. Then they saw what seemed to be fire come into the house, and pieces of the fire sat on the head of each person. Then each person was filled with God's Spirit, and they began to speak in other languages that they did not understand. The disciples were very surprised because this had never happened before. They were very happy. They realized that now they had received the Spirit of God, just as Jesus had promised. Now they knew how Jesus could be with each one of them wherever they went. His Spirit was living in their hearts, and He would never leave them. This promise is for us too. If we ask Jesus to take away our sins and be our Saviour, then He sends His Spirit to live in our hearts forever. God's Spirit is there to teach us about Jesus and to help us understand His Word (message, teaching). God's Spirit helps us to know what is right and wrong. He gives us the power to live a life that pleases God, and He helps us to tell others about Jesus. He keeps our hearts at peace and helps us when we have times of trouble. When God sent His Spirit to the disciples of Jesus they spoke in languages that they did not understand. They did this so that other people could hear about the great works of God in their own language. Listen and you will hear more about this. At that time Israelites from many different countries were in Jerusalem. They had come there for important meetings in the big temple. When people heard the loud roaring noise like a strong wind they rushed down to the house where the disciples were. The people who had come from many different countries heard the disciples speaking in their own languages. They were speaking about the great works of God. The people were very amazed and could not understand what was happening. But some people scoffed and said that the disciples were drunk. Peter, who was the leader of the disciples, stood up and spoke to all the people. He said, "Some of you are saying that we are drunk. Well that is not true. What is happening here today was told (prophesied) many years ago by the prophet Joel. He said that in the last days God would send His Spirit upon all people, and they would do many great works to show to others the power of God's Spirit. And if anyone calls out to God to help them, then He will do that. What you see and hear today is the Spirit of God showing His power to you all." Then Peter spoke to them about Jesus. Jesus had lived among them, teaching God's Word and doing many mighty miracles (works). However the Israelites, with the help of the Roman soldiers, had killed Jesus on the cross. God had allowed this, because it was His plan for Jesus to die, and pay the penalty for the sins of all people. But God raised Jesus to life again, for it was not possible for the grave to hold Him. Peter told the people that all the disciples had actually seen Jesus after He had risen from the grave. Now Jesus had been raised to the place of great honour and power at the right hand side of His Father God. Jesus had sent God's Spirit to live in the hearts of His disciples, and that is what the people were seeing and hearing. Then Peter said, "I want to say clearly to all people in Israel. You have killed Jesus on the cross, but God has raised Him up to be the great Leader and Saviour of Israel." When the people heard this they were very disturbed, and they asked Peter and the other disciples what they should do. So Peter spoke to them again and said, "You must turn away from your sins and come to Jesus. Be baptized in the name of Jesus to show that you are one of His followers, and He will forgive your sins. You will also receive the gift of God's Spirit, just like we have. He is available now to everyone, everywhere." Many people listened carefully to Peter, and they decided that they would become followers of Jesus. (There were about three thousand of them altogether.) They were all baptized and received the gift of God's Spirit. This was the beginning of the group of people who were known as the followers of Jesus (Christians). Many people in Jerusalem became followers of Jesus. Later they were called Christians. They were very happy and they would meet together every day. They shared their possessions with each other, and they cared for one another. Each day they would go up to the big temple in Jerusalem. There they would pray and praise God together. Many of the people were new followers of Jesus, so Peter and the other disciples who had been with Jesus would teach them about Jesus and all the things He had said. 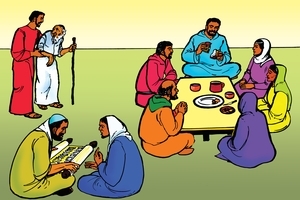 The Christians would meet together in their homes and share their meals with each other. Jesus had also taught His disciples a way that they could remember Him. On the night before He was crucified, Jesus had a meal with His disciples. During the meal He took some bread, broke it into pieces, and gave the pieces to His disciples. Jesus told His disciples that the bread was to remind them of His own body, which was going to be broken for them. This happened when Jesus was nailed to the cross. At the same meal, Jesus took a cup (or red wine, drink) and gave it to His disciples to drink. He told them that the drink was to remind them of His blood that was going to be shed for them. That happened when Jesus died on the cross and shed His blood. So Jesus told them that each time they had a meal like that, and broke the bread and took the drink, they would remember that He died for them. This is what the followers of Jesus did when they met together. Many people in Jerusalem saw the Christians meeting together, praising (honouring) God, and helping one another. They saw that what the Christians were doing was very good. So, many more people became followers of Jesus. That is an example for us too. As we meet together as Christians, and as we help one another, let us pray that other people will see us, and that they will want to become followers of Jesus too. One afternoon, Peter and John went up to the big temple in Jerusalem. They were going to meet with the other followers of Jesus and pray to God. At the entrance to the temple a man was sitting. His legs were crippled, and had been like that ever since he was born. He sat there hoping that people would give him some money. But I will give you something else that I have. I command you in the name of Jesus Christ (of Nazareth) to get up and walk." Then Peter took the man by his right hand and pulled him up. The man's feet and legs became strong at once and he began to walk. He went into the temple with Peter and John, and he was walking and jumping and praising God with a loud voice. People saw the man walking and jumping and praising God, and they recognized that this was the man who had been crippled. Soon a big crowd of people gathered to see what had happened. Peter spoke to them:- "Why are you so surprised that something like this should happen? Don't stare at us as if we have made this man strong by our own power. This man has been healed (made strong) by the power of Jesus. This man believed that Jesus' power could heal him, and now he can walk. Jesus is the one that you Israelites handed over to (the Roman governor, Pilate, and demanded that he) be killed. But God raised Jesus to life again, and John and I have seen Him. You Israelites did that to Jesus because you did not understand that He was the one God had promised to be the Saviour of Israel. Now you must turn away from your sin and come to Jesus. He will forgive you and give you His Spirit." While Peter was speaking to the people, the Israelite leaders sent soldiers, and arrested Peter and John. The leaders were angry that Peter was saying that Jesus had risen from the dead. Even though Peter and John were put in jail, many of the people who heard them became followers of Jesus. God's Spirit gave power to the disciples to heal people and to do many great works. He also helped them to speak to others about Jesus. As a result, many people became followers of Jesus. God's Spirit is with us too. Pray that He will help us to do many great works for God and to speak to others about Jesus. The Christians in Jerusalem tried to help one another as much as they could. They put their money together to help buy things for the poor people. One man named Barnabas sold his land, and brought the money to the Christian leaders, so they could use it to help the poor. Another Christian named Ananias thought he would do the same thing. He sold some land. 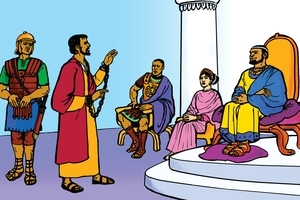 He and his wife Sapphira agreed to keep some of the money for themselves, but they did not want other people to know this. They wanted the Christians to think that they were being very generous to the poor, and that they were giving to the poor the full amount they had received for the land. 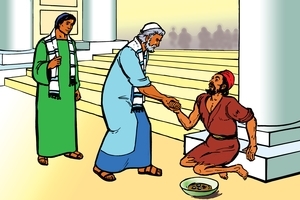 Ananias brought the money to Peter. 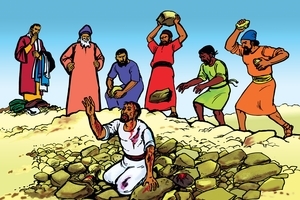 He lied to Peter and told him it was the full amount they had received for the land. But Peter knew that Ananias had kept part of the money for himself. Peter said, "Ananias, Satan has controlled you and made you lie to God about this money. When you sold the land, the money was yours. You did not have to give it all to help the poor. You tried to lie to people, but you really lied to God.."
When Ananias heard what Peter said he fell down and died. Everyone was very shocked. The young men wrapped up Ananias' body and carried him out and buried him. 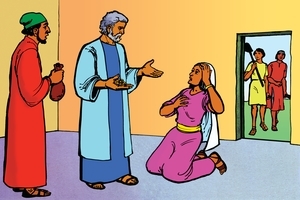 About three hours later, Ananias' wife, Sapphira, came in to the place where Peter and the disciples were. She did not know anything about how her husband had died. Peter spoke to Sapphira, "Sapphira, the amount of money that your husband brought in to us, was that the full amount you received? Sapphira replied, "Yes, that was the full amount." Peter said, "That is a terrible thing to do, for you and your husband to agree together to try and deceive God. You have lied not only to people, but to God. The young men who have just buried your husband are coming in the door now. They will carry you out and bury you too." Sapphira fell to the ground and died straight away. The young men carried her out and buried her beside her husband. When all the Christians heard what had happened, they thought about God with great awe and respect. They realized that God's Spirit knew the hearts of all people. They also realized how much God is displeased when we deliberately sin against Him. God is just the same today. He knows the hearts of all people. He does not want us to willfully sin against Him. Let us be careful not to displease God in the things we do and say. There were now many people in Jerusalem who were Christians. The Christians still wanted to help one another, especially those who were sick, or poor. It was a big task to look after all the needy people. So the Christian leaders appointed seven men to look after this work. Stephen was one of these men. He was full of God's Spirit so that everything he said and did was good. God's Spirit also gave him power to heal people and to do many great works. As he went about helping the poor people he also spoke about Jesus, and many people listened. Some of the Israelites opposed Stephen and argued with him. But Stephen's speaking was always good and they could never defeat him. So, these Israelites told lies about Stephen. They said that he was speaking against the temple and against the Israelite laws of Moses. So the Israelite leaders brought Stephen to court. In the court, Stephen spoke to all the Israelite leaders. He reminded them how many of their ancestors, right from the time of Abraham, had rebelled against God. They had killed many of God's messengers, and now they had killed Jesus, the man God had sent to be their Saviour. Stephen said they were people who rebelled strongly against God. This made the Israelites very angry. Then Stephen looked up and saw a vision of Jesus in heaven. Stephen said, "Look, I see Jesus, (the Messiah) standing at the right hand of God, in heaven." The Israelites became very angry. They thought it was wrong for Stephen to say that Jesus was God's Saviour for Israel. They did not like him saying that they had killed God's chosen man. So the Israelites took Stephen outside the city and began to throw stones at him, to kill him. As Stephen was dying he prayed to God and said, "Lord Jesus, don't hold this sin against these people." Then he died. One of the young Israelite leaders stood by them, looking after the men's coats. His name was Paul. Paul was very angry about the things Stephen had said. Paul thought that the best way he could please God would be to stop people from following Jesus. So from that day Paul did many bad things to the Christians, so that people would not want to follow Jesus. Stephen was not afraid to speak about Jesus, even when people did bad things to him and made him suffer. Also, Stephen was not afraid to die. He knew that he would go straight to Heaven to be with Jesus, and that would be very happy for him. Paul did many bad things to the believers (Christians) in Jerusalem. He wanted to stop them from following Jesus. As a result, many Christians left Jerusalem and went to other places. But at every place, they told people about Jesus, and many more people became Christians. In this way, God's Spirit made the Christians go away from Jerusalem and to many other places to tell people about Jesus. One of the Christian leaders was named Philip. He left Jerusalem and went to Samaria, where he spoke to the people about Jesus. He also did many great works there. God's Spirit helped him to heal sick people, and to cast out evil spirits from people. Because of this, many Samaritan people became Christians. Then God sent an angel to speak to Philip. He told Philip to go over to the road that went from Jerusalem down to the desert place of Gaza. When Philip got there he saw a chariot coming down the road. 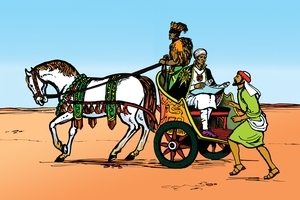 He went over to the chariot and heard the man reading from God's Word. The man was an important official from Ethiopia, in Africa. He had just been to Jerusalem to worship God. Philip said to the man, "Do you understand what you are reading?" The man said, "No, I need someone to help me." So Philip got up in the chariot with him. The man was reading what Isaiah, one of God's prophets had written many years before. It said, "He was led like a sheep going to be killed. He was treated unjustly (badly). They took away his life." The man said, "Is Isaiah talking about himself, or someone else?" So Philip explained to him that this was speaking about Jesus. Then Philip taught him many other things about Jesus from God's Word. As they were traveling along they came to a place where there was some water. The man said to Philip, "Here is some water. Can I be baptized now?" Philip said, "Yes, if you really want to follow Jesus with all your heart." The man said, "Yes, I believe that Jesus is the Messiah (God's chosen Man), the Son of God." So Philip baptized the man in the water. Then the man was very happy and continued on his way. God's Spirit took Philp to other places to tell people about Jesus. Philip is a good example to us. We need to be ready to go wherever God's Spirit tells us, and tell people about Jesus. The Christians continued to go to many places, telling people about Jesus. Because they were Israelites, they only spoke to Israelites. But God wanted the Gentiles (non-Israelites) to hear about Jesus too. God wanted Gentiles to become Christians. To help the Israelites to understand this, God sent a special message to Peter. This is what happened. Peter had gone to a place by the sea, called Joppa, and was staying with a friend named Simon. One day, at mid-day, Peter went up onto the flat roof of the house to pray. He became very hungry, so his friends prepared some food for him. While Peter was waiting for the food, he had a dream. He saw a very large sheet come down from heaven. On the sheet were many different kinds of animals and birds. 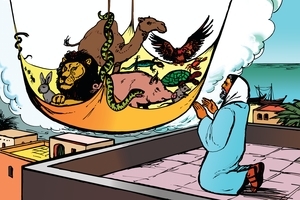 The law of Israel said that none of these animals could be eaten by Israelites. Then Peter heard a voice which said, "Get up Peter. Kill some of these animals so that you can eat." Peter knew that it was God speaking to him. He was very surprised that God would ask him to do anything like that. Peter said, "No, Lord. I could not do that. I have never eaten anything like that. They are unclean (forbidden) to us Israelites. Then God said, "If God says something is good for you to eat, don't you say it is unclean." This same dream happened three times, then Peter woke up. Peter was very puzzled about the dream. He knew that it was very important because it had happened three times. However, he wasn't sure what it meant. Just then some visitors arrived at the house. 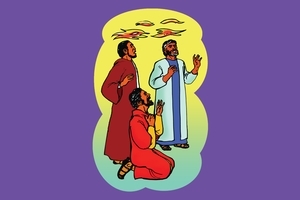 God spoke to Peter again, "Peter, three men have come to see you. Go down and meet them. Don't be afraid to go with them, because I have sent them." 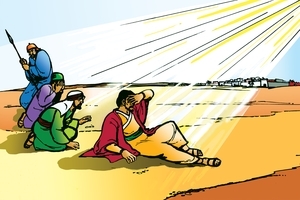 Peter went down to meet the visitors and found that they were Gentiles. Then Peter began to understand what the dream meant. The law of Israel said that an Israelite should not bring a Gentile into his house, and an Israelite should not go into a Gentile's house. Israelites said that Gentiles were unclean. Peter realized that God wanted him to think of Gentiles just the same as he thought of Israelites, and not to think of them as unclean people. 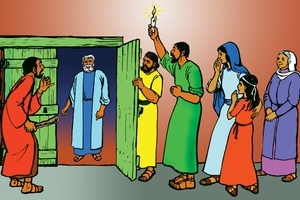 Peter invited the three Gentile men to come into the house, and to stay for the night. The next day he went with them to visit another Gentile. Listen and you will hear more of this story. Remember, it is always important to obey what God says to us. God knows what is best for us, and what are the right things for us to do. Peter, with some of his Israelite friends, and the three Gentile men, left Joppa and went to a place called Caesarea. There they went to the house of a man named Cornelius. Cornelius was a Gentile. He was a Roman army officer. Cornelius loved God, and prayed to Him a lot. The whole family of Cornelius loved God too. Cornelius had done many good things for the Israelite people. Some days before, God sent an angel to speak to Cornelius. The angel said, "Cornelius, God is pleased with you. He has heard your prayers. Now you must send some men to Joppa. Find a man called Peter and invite him to come and visit you." That was when Cornelius sent the three men to Joppa. 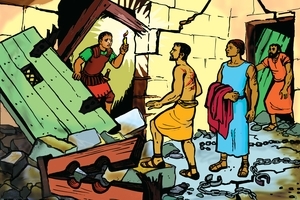 Peter and his friends arrived at the house of Cornelius and came inside. 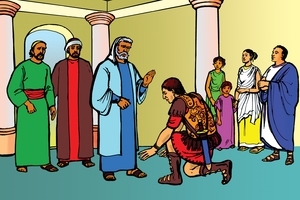 As they came inside, Cornelius knelt in front of Peter (to show him great honour). But Peter said, "No, stand up! I am not a god, I am just a man." Then Peter spoke to all the Gentiles who had gathered in Cornelius' house. "You Gentiles know that it is against the law of Israel for an Israelite like me to come into a Gentile house. But God has shown me (in a dream), that I should not think of Gentile people as unclean. So, I have come to you. Cornelius told Peter how the angel had come and spoken to him. Then Peter knew that he should tell these Gentiles about Jesus. So he told them what Jesus had taught, and about His great miracles. He told them how the Israelites had crucified Jesus but that God had raised Him to life again. Now, anyone who turns from their sin and asks Jesus to forgive them, He will take away their sins. While Peter was still speaking, God's Spirit came to each of the Gentile people who were listening. The Israelites who came with Peter were very surprised that God's Spirit was being given to the Gentiles. Peter said, "These Gentiles have received God's Spirit, just the same as we did. I can see no reason why we should not baptize them." So they baptized them all in the Name of Jesus. Cornelius and all his family and friends were very happy, and they asked Peter to stay with them for some days and teach them more about Jesus. This story tells us about the first time that the Israelites went to the Gentiles and told them about Jesus. God wants all people everywhere to come to Him. God does not think of any people as being unclean. God's message is for all Israelites and all Gentiles everywhere. Many groups of Christians were being established in many places. This made the Israelite leaders very angry. King Herod was the government ruler of Jerusalem, and he wanted to please the Israelite leaders. He began to persecute (do bad things to) the Christians. He killed James, one of the Christian leaders, and this made the Israelite leaders very happy. So then Herod put Peter in prison, with many soldiers to guard him, so that he could not escape. 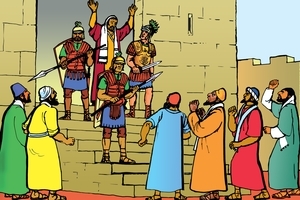 Herod wanted to bring Peter to court and then kill him. The Christians prayed earnestly for Peter, that he would be kept safe. They prayed day and night. Peter was not afraid. He had been in prison before. He was not afraid to die, because he knew he would go straight to be with Jesus. He also knew that God was the ruler over all things, and He could get him out of prison if He wanted to. One night, Peter was asleep in prison. The next day he would be taken to court. Peter's hands were chained to two soldiers, one on each side. Suddenly one of God's angels came into Peter's prison cell. 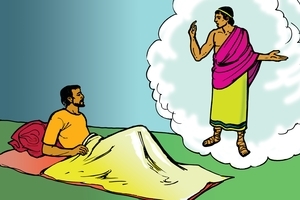 He woke Peter up and said, "Quick, get up, put on your clothes and shoes, and follow me!" At once the chains fell off Peter's wrists. He got dressed and followed the angel. They went through prison doors and past soldiers, but nobody stopped them. Peter thought he was dreaming. They came to the large outer gate of the prison and it opened by itself. They walked through and went along the street. Then the angel disappeared. Peter realized that he was not dreaming. God had sent His angel and taken him out of prison. Now he was free from the power of Herod and the Israelite leaders. Peter was very happy! We know that sometimes Christians go through times of trouble and suffering. Often this happens if Christians stand firm and show to others that they are followers of Jesus. Whatever happens we do not need to be afraid. We know that God rules over all things. He controls the leaders of government. We can trust God to watch over us wherever we are. When King Herod put Peter in prison, the Christians got together and prayed. They knew that James had been killed, and they knew that it was likely that Peter would die too. But they knew that God was very great. God's power was greater than the power of Satan, and the power of men. So they prayed to God, and kept on praying day and night. They prayed that Peter would be kept safe. God's angel brought Peter out of prison and left him on the street outside. Peter decided to go to the house of Mary, who was the mother of one of his friends, John Mark. A large group of Christians was meeting there. Peter knocked at the door of the house, and a servant girl named Rhoda came to see who was there. When she came to the door, Peter called out. Rhoda recognized that it was Peter's voice. She was so excited that she did not open the door, but ran back inside to tell everyone that Peter was there. The people did not believe her; they thought she was being silly. Rhoda insisted that Peter was there. While they were talking Peter kept knocking at the door. So they all came and opened the door and saw that it really was Peter. Everyone was amazed and happy. 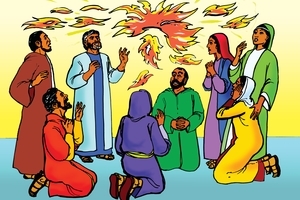 Peter told them how God's angel had brought him out of prison, and they all gave great praise to God. Peter told them to tell the other Christians what had happened. Then he left there to go and stay at a place where he would be safe. After that, Peter spent many years traveling to many different places. He helped the Christians, and taught many people about Jesus. This story helps us to understand that our God is a great God. God hears and answers our prayers, and He wants us to pray to Him at all times. God's power is very great and He rules over all things. God has said, "Pray to me and I will show you many great things, even more than you could think of." (One of Jesus' followers said, "God is able to do more than we could ever ask for or even think about.") It is good if Christians meet together and pray. God will hear and answer our prayers. We heard before how Paul did many bad things to the Christians in Jerusalem. However, this did not stop people from following Jesus. More and more people became Christians. So Paul worked harder to try and stop them. Paul thought that God was pleased with what he was doing. Paul wanted to stop people from becoming Christians in other places too. He decided to go to a place called Damascus. The Israelite leaders gave him letters of authority so that he could arrest Christians and bring them back to Jerusalem as prisoners. Paul and his companions traveled on the road to Damascus. They were almost there, when a very bright light shone around them. They all fell to the ground. Then Paul heard a voice speaking to him. "Paul, Paul, why are you persecuting me." Paul said, "Who are you, Lord?" The voice replied, "I am Jesus, whom you are persecuting. I have appeared to you now to appoint you as my servant. You are going to tell others about me, and I will protect you as you do that. You will go to the Gentiles and tell them about me. You will open their eyes to see God's truth. You will turn them from Satan's darkness so that they will live in God's light. I will forgive their sins and they too will become God's people." Paul was very surprised and shocked. The light went away and Paul got up from the ground. But now Paul was blind, and the other men had to lead him along the road to Damascus. There, Paul stayed in the house of a man named Judas. He did not eat or drink for three days. He just prayed to God. Paul had done many bad things to the Christians, but he did not realize that he was fighting against God. Now he was ashamed of what he had done. Now he wanted to follow Jesus and serve Him. This story helps us to understand that God's power is very great. Some people may work very hard to oppose God. They try to stop people from following Jesus. Only God can change people like that. God can take away their sin and give them a new heart. Then they will love God and try to please Him. They will become followers of Jesus too. Paul was in Damascus for three days without eating or drinking. He could not see: he just prayed to God. One of the Christians in Damascus was named Ananias. 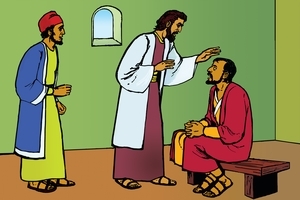 God spoke to him (in a vision) and said, "Ananias, I want you to go over to Straight Street, to he house of Judas. There you will find a man called Paul. He is praying to me. I want you to go and put your hands on his eyes so that he will see again." But Ananias said, "Lord, I have heard about Paul. He has done terrible things to the Christians in Jerusalem. Now he has come here to do the same to us!" God said, "Go, and do what I say. I have chosen Paul to go to the Gentiles and tell them about me; and to speak to their Kings, and to the Israelites too. He will suffer many things for me." Although Ananias was afraid of Paul, he did what God said. He went to Judas' house and found Paul there. He put his hands on Paul's eyes and said, "Brother Paul, Jesus, whom you saw on the road, has sent me to you so that you can receive God's Spirit, and so that you can see again." Straight away Paul was able to see again. He received God's Spirit and was baptized. He stayed for a few days with the Christians in Damascus, then he began to preach about Jesus. He began to tell everyone that Jesus was the Son of God. Paul was a very good speaker, and many people came to listen to him. People were amazed because they knew Paul had fought so strongly against the Christians. Now he himself had become a follower of Jesus. Paul became one of God's great servants, as he told people in many places about Jesus. Sometimes God may ask us to do difficult things. We do not need to be afraid to do what God asks of us. We know that God will care for us, and He will help us. God can use us to speak to other people. We can help them to become followers of Jesus. Christians from Jerusalem traveled to a place called Antioch, and there they told people about Jesus. At first they only spoke to Israelites, but then many Gentiles heard about Jesus, and they became Christians too. The Church leaders at Jerusalem heard about this and they went Barnabas to help them. Barnabas was very happy to see the great works God was doing, and how many people were becoming Christians. Barnabas realized the work was too much for him, so he traveled over to where Paul lived. He brought Paul with him back to Antioch. Together they taught the new Christians. Soon there was a large group of Christians who loved God and did many good works. 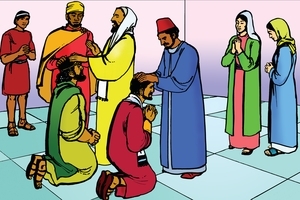 One day the leaders of the Christians were praying together. God's Spirit spoke to them and said, "I have a special (important) work for Paul and Barnabas to do. I want you Christians to send them out to do this work. I want them to go to other places and tell people about Jesus. This story helps us to understand that God's Spirit wants people to take God's message to other people who have not heard it yet. Paul and Barnabas were doing a good work in Antioch, but God thought it was more important to send them off to other places. Paul and Barnabas did not just go off by themselves. The Christians at Antioch sent them, and they were partners with them. They prayed for them all the time, and they made sure they had the things they needed for their journey. There are still many people in many places who don't know about Jesus. Christians are the ones who need to go to these places to tell them about Jesus. We need to be ready to go, if God's Spirit tells us to go. We need to be partners with those who do go. We must pray for them. We must make sure they have all the things they need. "People of Israel, and all others who worship God, listen to my message. You know how God chose our ancestors, such as Abraham and Moses. God did many great works through them, and He promised to send a Saviour to help us all. God gave Israel a great King, named David, who loved God and obeyed Him. God said that the Saviour who would come would be a descendant of David. Many of God's prophets told us about the Saviour who would come to us. This Saviour has now come to us! His name is Jesus. He lived in Israel and did many great works. But the Israelite leaders did not believe that Jesus was God's chosen One. They would not have Him as their King, and they asked the Roman government to kill Him. Jesus did not do anything wrong, but they killed Him on the cross. Jesus did this to pay for our sins. Many years before God had said this would happen, and it is written in His Word. God raised Jesus from the dead, and He lives forever. Now, anyone can come to Jesus and He will take away their sins. Israelites and Gentiles can all come to Jesus. He will forgive your sins and make you right with God." The people were very amazed to hear this message. Many of the Israelites believed what Paul said. Many of the Gentiles believed it too, but some of the Israelites were angry at what Paul said. They refused to listen to Paul, and chased him away from the Israelite meeting place. So Paul and Barnabas gave their message to the Gentiles as well as the Israelites. Soon groups of Christians were meeting in all the places that Paul visited. 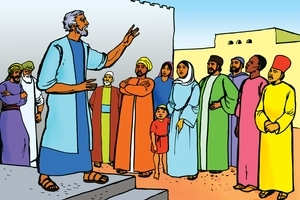 Paul and Barnabas stayed with the Christians and taught them about Jesus. Sometimes angry groups of Israelites would chase them away to another place. They went through many times of difficulty, but they were very happy as they saw many people becoming Christians. After a long time they returned to Antioch. They told the Christians there what they had done. They too were very happy. As we tell other people about Jesus, we may have times of difficulty. Let us be like Paul and Barnabas. Let us keep on with the work God has called us to do. We will be very happy as we see people come to Jesus. After Paul had been in Antioch for some time, he thought it would be good to go back to the places he and Barnabas had visited before. Paul wanted to encourage the new Christians in those places, and he wanted to teach them more about Jesus. This time Paul took Silas with him as a helper. At each place Paul and Silas visited, the Christians were glad to see them. Paul taught them more about Jesus and they became strong in their desire to obey God's Word, and to please God in all they did. Also many more people became Christians in these places. Then Paul and Silas went on to other places, where they had not been before. God's Spirit guided them all the time. Sometimes they would think about going to a place, but God's Spirit would say "No." They would only go on to a place where they knew God's Spirit was saying "Yes" to them. One night Paul had a vision (dream). In the vision he saw a man calling to him and telling him to come and help this man and his people. The man was from another country called Macedonia. The people of Macedonia were different to Paul. They spoke a different language, and they had a different culture. Paul knew it would be very difficult to go to Macedonia and tell the people there about Jesus. It would be much further away from the people and places he knew. Speaking to people who had a different language and culture would be difficult. He did not know anyone there who would be able to help him. Paul knew that God was calling him to go to Macedonia, and tell those people about Jesus. Paul knew that God's Spirit was with him. God's Spirit would help him to talk to the people. God's Spirit would guide him all the time. Paul knew that it would be a very difficult time for him, but he was happy to obey God's call and go to Macedonia. The next morning he and Silas prepared their things and set off on the journey to Macedonia. God's Spirit guides us today too. As we read God's Word, He speaks to us. As we pray to God, He speaks to our hearts. (Perhaps He will speak to us in a dream, too.) Christian friends can help us and guide us, too. But our hearts must be open to hear God's Word all the time, and we must be ready to do whatever He asks us to do. Paul and Silas traveled by ship and came to the country of Macedonia. They went to a place called Philippi and stayed there for some days. They began to teach people about Jesus, and some of them became Christians. In this place was a girl who had an evil spirit. Through the power of this evil spirit the girl was able to predict things in the future. Some men owned this girl and they made a lot of money from what she could do. Paul cast out the evil spirit from this girl, by the power of God's Spirit. Now she was free from the power of Satan. But the men who owned the girl were very angry. Now they could not make any money from her. They dragged Paul and Silas off to the city court. There they told lies, saying that Paul and Silas had caused a lot of trouble. The Government officials ordered the soldiers to whip Paul and Silas and then to lock them securely in prison. Paul and Silas had done nothing wrong, and yet they suffered many bad things. However they knew that God's Spirit was with them. They knew that He was the one who controlled what happened to them. That night it was difficult for them to sleep. Their backs were very sore (from the whipping) and they were bound with chains. So they prayed and began to sing songs of praise to God. 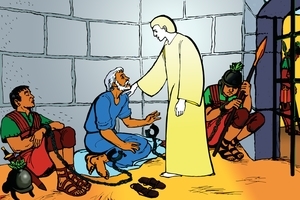 This made them feel better, and helped them to tell the other prisoners about Jesus. Then, at midnight, a strong earthquake shook the prison. The doors flew open and the chains fell off the prisoners. The man in charge of the prison ran in, but it was very dark, and he could not see what had happened. He thought all the prisoners had escaped. This meant that the government officials would be very angry with him. So he drew out his sword and was about to kill himself. But Paul called out, "Don't harm yourself! We are all here!" The man got a light and ran into the prison and saw Paul and Silas there. He knew that Paul had talked and sung about God, and that God would punish people for their sin. He realized that it was God who had caused the big earthquake. He came trembling and knelt in front of Paul, and said, "I am a sinful man. Can you help me so that God will not punish me for my sin?" Paul talked to the man about Jesus and said, "If you come to Jesus and ask Him to forgive your sins, He will do that: and He will do that for your whole family too." Paul taught the man and all his family about Jesus. The man took Paul and Silas and treated the wounds on their backs. Then the man and all his family became Christians and were baptized. Paul and Silas were released from prison and went on to other places to tell people about Jesus. It is the same today too. Sometimes Christians suffer bad things. Sometimes Christians area put in prison when they have done nothing wrong. But we know that God's Spirit is with us all the time. He can give us joy in our hearts, and He can help us to tell others about Jesus, even when bad things are happening to us. Paul went on to another place called Athens. There he saw many images (idols) and temples for (false) gods. 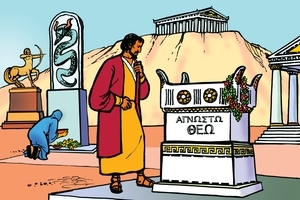 Many of the people at Athens were teachers. They taught people about (false) gods, and they taught about different ways of thinking and living. Paul talked to these people about Jesus. He talked to both Israelites and Gentiles. Many of the people were interested in the message that Paul gave, and they asked many questions. One day they asked Paul to speak to the people at a meeting. All the teachers and wise men of Athens came to this meeting. This is what Paul said to them all: "I see that you people are very careful to follow the laws (teaching) of your (false) gods, your teachers, and your wise men. You have even built an altar that is dedicated (given) to "the God we do not know". You don't know this God, so I will tell you about Him. God is the one who made everything in heaven and on the earth, and He rules over all things. He is so great that He does not live in temples, or other places made by people. He does not need people to bring food or other things to Him. No! He Himself gives life and breath to all living things. He made all the peoples of the world from one couple, Adam and Eve, and He put them in different places all around the world. He did this so that people would seek after God, as you people are doing. And God is not far from any one of us. God made us like Himself, so we should not think that God is anything like an idol (image). God is willing to forgive us for the mistakes we have made in the past, but He wants all people everywhere to turn away from their evil ways. God has fixed (marked) a day when He will bring all people to court for their sins. God has appointed one person to judge all people, and He showed who this person was by raising Him from the grave......."
The people listened carefully to Paul until they heard him talking about God raising a man from the grave. Then some people laughed at him and went away. Others said they would listen to him again at another time. But some people went with Paul, and they became Christians. God's Spirit had helped Paul to speak to these people in a way they could understand. They had never heard of God or Jesus before, but now they knew that God loved them. They knew that Jesus had died for them and risen from the grave. Now they wanted to love Him and follow His teaching. God's Spirit can help us too. He can give us the right words to say to the people we meet. Let us be ready to tell other people about Jesus whenever we can. Paul left Athens and went on to another place called Corinth. Corinth was an important city, but most of the people did not know God. Many of the people did very evil things. There were some Israelites living there. Paul stayed with two of them, Aquila and his wife Priscilla. They were tent-makers, like Paul, and Paul stayed and worked with them. 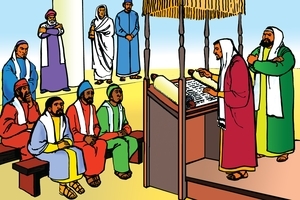 Each Sabbath day Paul went with them to the Israelite meeting place (synagogue). There he spoke to the people about Jesus. The people listened, but after a while some of the Israelites began to oppose Paul. They would not accept that Jesus was God's Son, and that He was the one who had come to save all people. They also said evil things about Paul. So Paul stopped preaching to the Israelites. He said to them, "From now on I will speak to the Gentiles." Some of the Israelites became Christians and went with Paul. Many of the Gentiles became Christians. It was a very difficult time for Paul as these Israelite people opposed him and said many bad things about him. But then God spoke to Paul in a vision (dream). God said, "Don't be afraid Paul; keep on speaking for me. Don't give up what you are doing. Remember, I am with you. There are many people in this city who belong to me." Paul continued to teach the people about Jesus. He stayed in Corinth for about one and a half years. Then a new Roman Governor was appointed to Corinth, his name was Gallio. The Israelite leaders thought this was a good time to try and get Paul into trouble. They took Paul by force to the court. They said to Gallio, "This man is causing trouble. He is trying to make people worship God in a way that is against our Laws!" But Gallio would not listen to them and sent them away. So Paul was able to continue his teaching, and many more people became Christians. In the same way, we may have trials and difficulties as we try to live as Christians, and as we talk to others about Jesus. God says the same to us, "Don't be afraid, keep on speaking for me. Don't give up what you are doing. Remember, I am with you." Paul traveled to many places, visiting all the new groups of Christians and teaching them more about Jesus. Then he felt that God was telling him to go to Jerusalem. Many people warned him not to go there. They said that the Israelites would try to kill him, but Paul was not afraid to go. He said that he was ready to die for Jesus, if that is what God wanted him to do. When he arrived in Jerusalem, Paul met with many of the Christians. They had heard many (bad) things about Paul, but mostly that he was teaching against the Law of Moses. So they suggested that he should carry out one of the Israelite customs, along with some other men. Then everyone would see that he had not rejected the Israelite laws. So Paul went with the men to the big temple in Jerusalem. But, in the temple were some Israelites who came from places where Paul had been preaching to the Gentiles. They saw Paul there, and started shouting to all the people. They said, "This is the man who goes everywhere teaching people bad things about Israel, and our Law, and this temple. And he has brought Gentiles in here to make the temple unclean." Paul had done none of these things that the people were shouting about, but many of the Israelites there became very angry with Paul. They dragged him out of the temple and started to kill him. Some Government soldiers heard all the noise and they ran quickly and dragged Paul away from the angry people. The soldiers took Paul over to the jail to find out what wrong he had done. As they were going, Paul asked for permission to speak to the people. Paul stood on the steps and told the people how he had become a follower of Jesus. The people listened carefully until Paul said how Jesus had told him to take God's message to the Gentiles. The Israelites did not like that idea, and so they started shouting again that Paul should die. The soldiers took Paul into the jail where he was safe. They also wanted to question him and find out why the people were so angry with him. Many times the Israelites and other people tried to hurt Paul, but Paul did not complain. He knew that God had work for him to do, and God would keep him safely until the work was done. He also knew the words of Jesus. "Happy are you when people insult you and persecute you, and tell lies against you because you are my followers. Be happy, for a great reward is yours in Heaven." The Roman soldiers kept Paul in prison. This was safer for Paul, as the Israelites were still trying to kill him. God spoke to Paul to encourage him and told him not to worry. Paul had spoken about Jesus in Jerusalem and God said he would speak about Him in other places too. The Roman soldiers took Paul away to another place, (Caesarea) where the Israelites would not be able to worry him. There he was brought to court before the Governor, Felix. The Israelites accused Paul of many bad things, but were not able to prove anything. The Governor did not want to offend the Israelites, and he also hoped that Paul would pay him some money to set him free. Paul did not do that, so that Governor left him in prison. Paul was in prison for two years and then another man became Governor. His name was Festus. 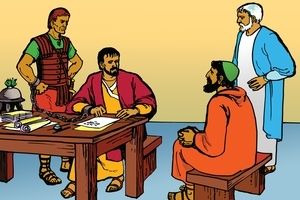 The Israelites again brought Paul to court before Festus and asked that Paul to be taken to Jerusalem and tried there. The Israelites were planning to kill Paul on the journey to Jerusalem. Paul knew what they were thinking and he said, "No, you cannot force me to go to Jerusalem. I will go to Rome. I will go to court before Caesar." So Festus said that Paul could do that. Rome was the biggest city in the world at that time, and Caesar was the King of the Roman Government. Soon after this, Festus had a visit from the man who was King in his area. His name was Agrippa. King Agrippa and his wife Bernice were interested to hear about Paul. So Festus arranged for Paul to speak to them one day. Many important people came to that meeting. The King asked Paul to speak to them all. Paul told the King about his own life as an Israelite, and how he had fought against the Christians to try and stop them. Then Jesus had appeared to him as he traveled on the road to Damascus. Jesus had told him that he was to go to the Gentiles and teach them about God. Then the Gentiles would turn away from Satan and from all their bad ways. God would forgive their sins, and they would become God's people. Paul said that he had obeyed this message from Jesus and he had been to many places to tell people about Jesus. This message was the same message that the Israelites knew about in the writings of Moses and the other Israelite prophets in the Bible. This message was for all people, so that Gentiles as well as Israelites could become people of God. The King and all the important people listened carefully to Paul. Paul was a prisoner, and he was a long way from all his family and friends. God was with him, and God prepared everything so that Paul was able to speak to the King, and to many important people. God can use us too. If we are ready to obey Jesus, just like Paul did. God can help us to speak for Him wherever we are. Festus, the Governor at Caesarea, arranged for some Roman soldiers to take Paul to Rome. It was a long journey and took many weeks. (Some of Paul's friends were allowed to travel with him.) They had to travel most of the way across the sea by ship. It was not a good time of the year to travel on the sea. The winds were strong and the sea was rough. They stopped at one place and Paul spoke to them all. "If you continue to travel on the ship you will have trouble. The cargo will be spoiled and people may die." But the captain (leader) of the ship and the soldiers wanted to keep going. So they set off to sea again in the ship. At first, the sea was calm and everything seemed to be alright. Then a strong wind began to blow, and a very bad storm came upon the ship. For many days the storm tossed the ship about. 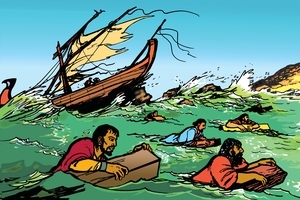 The people started to throw the cargo out of the ship, so that the ship would not sink. The people were very frightened and thought they would soon die. Then Paul talked to them all again. He said, "You should have listened to me before and then we would not have had all this trouble. But don't be afraid. God has spoken to me and said that none of us will die. God says that I must stand before Caesar (the Emperor, the leader of the Roman Government,) in Rome. You will all be kept alive, but the ship will run aground and the storm will destroy it. So, don't be afraid. I know that what God says will come true." The people were very happy to hear Paul's message. They had not eaten food for two weeks because they were afraid. Now they ate some food, and everyone felt better. The next morning the ship came close to an island. They tried to sail the ship up on to the beach, but it ran aground on a sand-bank. Then the storm started to break up the ship. So everyone jumped into the water and swam to the beach. Some people used pieces of wood to help them. Everyone was able to get to the beach. They were all very happy that they did not die in the sea. It was a very difficult time for Paul and his friends. They knew that God was with them, and that He would help them. They were also able to help the other people who were very frightened. We may have times of trouble too. But we know that God is with us, and He will help us. We can also be a help to others who are in trouble. After many months of travel, Paul and his friends, and the Roman soldiers arrived in Rome. Rome was the biggest city in the world at that time. The Roman Government was kind to Paul. They did not make him stay in a prison. He was able to live in a house, although he was always chained to a Roman soldier. Paul's friends were allowed to visit him and bring him food and other things he needed. There were many Israelites living in Rome. 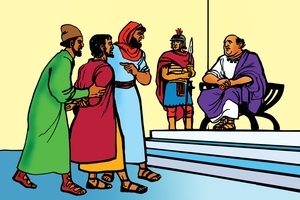 Paul arranged a meeting when all the Israelite leaders could come and talk to him. They all came one day, and Paul told them his message about Jesus. Some of the Israelites believed what he said, but others argued against him. Paul told them that he would also be giving this message to the Gentiles. Paul stayed in Rome for two years. It was a difficult time for Paul, as he wanted to go and visit all the places he had been to before. He wanted to help all the people who had become Christians. Instead, many people came to visit Paul in his house, and he was able to teach them about Jesus. Paul was also able to write letters to the places where people had become Christians. These letters gave a lot of very important teaching about Jesus, and about the things that Christians should do and say. These letters are in the Bible, and they are still teaching Christians all over the world today. It was a difficult time for Paul, but God helped him. Because of that, Paul was able to help others, and his letters are still a help to us today. This is one of the things Paul said in his letters:- "God is for us (on our side, always working for us). So, anyone who fights against us cannot win. God gave His own Son, Jesus for us. Jesus died and rose again from the grave, and now He is in Heaven speaking to God for us. Whatever happens to us, we have power to defeat Satan and sin, because Jesus lives in us. I am certain that nothing in the world can ever separate us from the love of God, because we have God's love when we have Jesus." That is something good for us to think about. Isn't it?